Kiel Reijnen celebrates his win in Aspen Monday in Stage 1 of the USA Pro Challenge (USAPC photo). 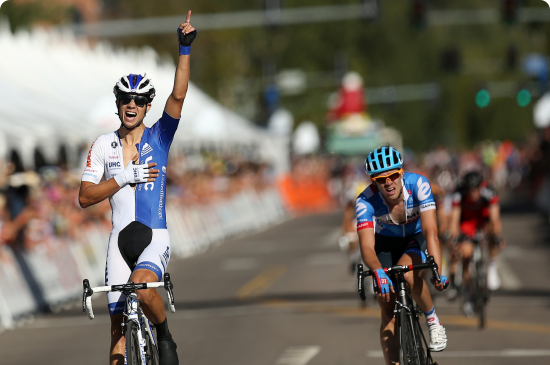 Colorado resident Kiel Reijnen (USA) of UnitedHealthcare Pro Cycling Team took home the Stage 1 win in the 2014 USA Pro Challenge on Monday, a victory that also propelled him in the overall lead heading into the second day of racing on Tuesday. Set in Aspen and Snowmass, the seven-stage event kicked off with a circuit race of three 22-mile laps that included 2,300 feet of climbing per lap, creating an aggressive day of racing. Each lap on Monday included the steep climb up to Snowmass Village, then a quick descent that led to two more short but challenging climbs. That was followed by a quick loop through downtown Aspen, riding through the streets of cheering fans, before heading out to do it all two more times. After neutral laps through downtown the cyclists were on their way. From the get-go attacks were coming of the front as the riders sped out of downtown Aspen. Danny Summerhill (USA) of UnitedHealthcare Pro Cycling Team launched the one that would stick and was soon joined by Joshua Berry (USA) of Team SmartStop, Ian Crane (USA) of Jamis-Hagens Berman p/b Sutter Home, Jonathan Freter (USA) of Jelly Belly p/b Maxxis, Gregory Daniel (USA) of Bissell Development Team, Lachlan Norris (AUS) of Drapac Professional Cycling, Matt Cooke (USA) of Jamis-Hagens Berman p/b Sutter Home and Luis Davila (MEX) of Jelly Belly p/b Maxxis. Berry fell off the back as Summerhill went for the Lexus Sprint Line and took first in downtown Aspen, followed by Davila and Daniel. With KOM points on the line during the second and third laps of this first stage, the riders prepared for the first climb of the day in Snowmass, with Lachlan taking first, followed by Davila and Ben Jacques-Maynes (USA) of Jamis-Hagens Berman p/b Sutter Home. As their lead continued to increase, the break approached the second KOM of the day at White Star Lane, where Norris took first, with Jacques-Maynes and Cooke following closely behind. In a chase led by Cannondale Pro Cycling, determined to set up their sprinter for the stage win, the gap started to close as the riders approached the second sprint of the day. Summerhill took max points again, followed by Freter and Jacques-Maynes. Heading into the final lap of the day, Jacques-Maynes attacked the break and gained a small lead. At the same time, Summerhill and Freter cracked and dropped off the back. At the third Sierra Nevada KOM of the day back in Snowmass, Jacques-Maynes hit the top first, followed by Norris and then Cooke. Heading into the final KOM of the day, the original break was absorbed by the field, leaving only Jacques-Maynes off the front. Then, in traditional fashion, fan favorite Jens Voigt (GER) of Trek Factory Racing attacked to join Jacques-Maynes as they crested the final KOM competition of the day. Jacques-Maynes took first, followed by Voigt and Lucas Euser (USA) of UnitedHealthcare Pro Cycling Team. With only a few miles to go, things started heating up. Voigt was reabsorbed as Javier Megias (ESP) of Team Novo Nordisk made a move off the front. In the final stretch of the race, Reijnen and Alex Howes (USA) of Team Garmin-Sharp chased for the win and overtook Megias. In a close finish, Reijnen took the stage win, followed by Howes in second and Ben Hermans (BEL) of BMC Racing Team in third. Hermans’s podium finish, three seconds back, led five BMC Racing Team riders in the top 15 in Monday’s opening stage. Fourth-place overall last week at the Larry H. Miller Tour of Utah, Hermans said he was given the green light to chase Reijnen and Howes in the final kilometer. After Hermans, BMC’s Michael Schär was seventh, Brent Bookwalter was ninth, Tejay van Garderen was 11th and Peter Stetina was 15th. All four arrived 12 seconds after the stage winner. Van Garderen, an Aspen native, said he made a smooth return to racing in the 98-kilometer race. The USA Pro Challenge’s defending champion had not raced since Aug. 2 at Clasica San Sebastian following a fifth-place finish at the Tour de France. Van Garderen said the team’s strategy to use specific riders to mark other teams’ leaders went accordingly to plan. Now the Pro Challenge heads to Crested Butte Tuesday for Stage 2. After the conclusion of the first stage of the USA Pro Challenge, Reijnen holds the Smashburger Leader Jersey, Lexus Sprint Jersey and, new for this year, the Colorado National Guard Best Colorado Rider Jersey . Jacques-Maynes has the Sierra Nevada King of the Mountains Jersey and Summerhill was awarded the FirstBank Most Aggressive Rider Jersey. Clement Chevrier (FRA) of Bissell Development Team has the Colorado State University Best Young Rider Jersey heading into Stage 2 tomorrow. Each year the USA Pro Challenge searches for ways to include more of Colorado’s deep cycling history. Last year it was the climb up Bachelor Gulch and this time around it will be Kebler Pass. Stage 2 opens fast by ripping down the Aspen Valley through the sprint cities of Basalt and Carbondale before tackling the 8,700 ft. McClure Pass. A short descent brings the race to Gunnison County Road 12, which is a 20-mile roller-coaster that constantly changes from pavement to dirt and back again, while topping out at 9,900 feet over Kebler Pass. A technical descent into Crested Butte brings the race back to familiar terrain. As in 2011 and 2012, the race will finish up with a sprint through downtown Crested Butte and the steep finish climb up to Mt. Crested Butte. For full results, course information and more, go to the official race website www.USAProChallenge.com.